Adjusted Brightness and contrast, Used the burning tool a little on his nose and beak, ran through neat image twice to soften, added borders. shannon its beautifull is the Albino Peacock copyright? I would love to use this and make a page for my msn group I Manage maybe this is an unusual request but I wanted to ask you first. I love this shot. I didn't even know albino peacocks existed. I've only actually been lucky to see an albino peacock once, this brought back great memories of that time. Thanks for posting a beautiful image. that is stunning shannon, i love the colour of it. i also love that the frame is filled. This is really stunning! I don't think I've ever seen an albino peacock, but you have certainly captured the beauty! This is truly a breathtaking photograph. The stark whiteness of that ethereal-looking bird is stunning by itself, and the effect is amplified by the blurry veil the out-of-focus tail fearthers create. One of my favorites from this site. Congrats on a top ten with this amazing and beautiful image! I SOOOO thought you should have had a ribbon for this one! It is absolutely flawless... Congratulations on your win of 8th out of 507 entries - NOTHING TO SNEEZE AT! I love it. Congratulations on your top 10 finish with this adorable white on white study. It has class! Beautiful work. I really like this one. Congratulations. I gave it an 8. ...cuz I knew it would finish 8th! Yeah, that's it. Fantastic job - congratulations. Magical - an instant favorite! Congrats on your top ten finish Shannon. Congrats on making the top 10. I like how it fills the frame. I also like the seeming purity of the shot with the white. Cool peacock, never seen a white one before. Nicely done. Very enchanting photograph; almost surreal and quite beautiful. It fills the photo very nicely and I love how the head is so sharp as opposed to the rest of the body. Pat on the shoulder is deserve, good luck! Never seen that before - amazing! Looks a little artificially soft in places but it's a great view and very dynamic. The only (very nit picky) thing I might add to this photo, is to not have it quite so centered... the rules of thirds would have pushed this to a 10. What a beauty! I'm in awe...This shot is wonderful. I have a shot of a similar subject too! Not this good though. Would have helped if the focus was on the head of the bird; it appears to be a little blurred. What a beautiful lacy creature...very "ghostly" looking. Love the nice soft subdued lighting. Incredible shot. Should be in the top 10 percentile at least. Great subtle color scheme. I'm not sure I like the extremely shallow DOF though. The focus seems to be off ever so slightly for perfection. Hope it does good. Is that for real? I like it. Good variation on a classic/cliche pose! I love this photo. It's magical! I like how the head of the peacock is in sharp focus, and how the peacock fills the frame. Great image! This would have been great if the birds head had been in good focus. Nice crop, and I can definitely see what you were going for here. 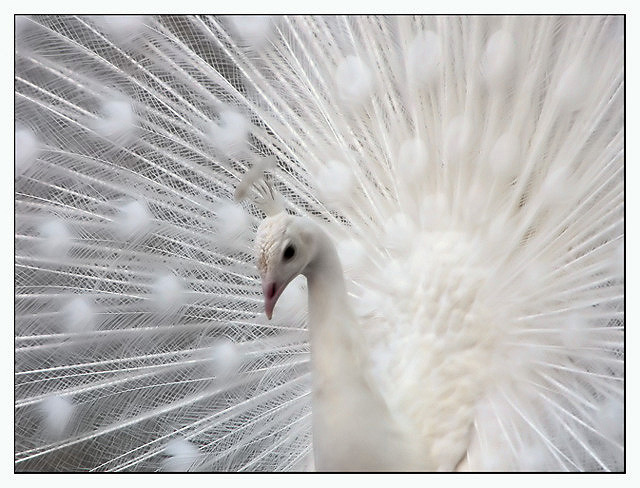 Wow, I have never even heard of an albino peacock, great photo! all the same, excellent capture. very nicely seen and composed. i really hope this does well for you, and that people take the time to appreciate it. good luck! Amazing... like snow...:) thanks for sharing. Lovely crop and shot. All the best. Just... wow! My only criticism, stopping me from awarding 10, is the slight softness around the eye. But still one of the highest scores I am giving in the challnege - 9.
nicely done, have tried to fotog. these a few times, not easy! Wow... very interesting and stunning capture. Seems to be a little bit of an overuse of NeatIMage... but very very interesting! Wow! I've never seen an albino peacock. He is very elegant looking. He is just a wee bit unfocused on the puffy round feathers. Otherwise you did a nice job framing him and the exposure is good. Desaturation or fluke of nature? :) This is interesting. I had no idea there were albino peacocks. Excellent and distinctive! I like the clean processing and clarity of the feathers. There's a slight muddy cast to the feathers which probably reflects the true colors of the bird but probably could have brightened up in the processing. Still a fantastic entry. Strong composition and powerful impact. Wow! That is amazing! I've never heard of an albino peacock, but it sure makes a unique and interesting picture!!! What a beauty! The composition and light are wonderful. The only think that could have improved the photo was to have his eye in focus and a little light in it. Beautiful creature! Ohhhh.... the thumbnail looked so very promising! If only the head had been in perfect focus and the rest of the image exactly the same as it is now I would have given this a 10 easy! However I still gave it an 7 just for the composition and tones in it and the monotone high key feel too it. Beautiful bird. Like the feather detail. Excellent dof use. Good composition. Like the light "airy" feeling of this photograph. Proudly hosted by Sargasso Networks. Current Server Time: 04/20/2019 02:21:13 AM EDT.